Sorry I was MIA Friday and Monday. It’s been a little crazy around here and just off. And amongst all the chaos I’m going to tackle another big project soon which I will talk about today. I’ve decided to finally replace all the upstairs carpet with hard flooring. 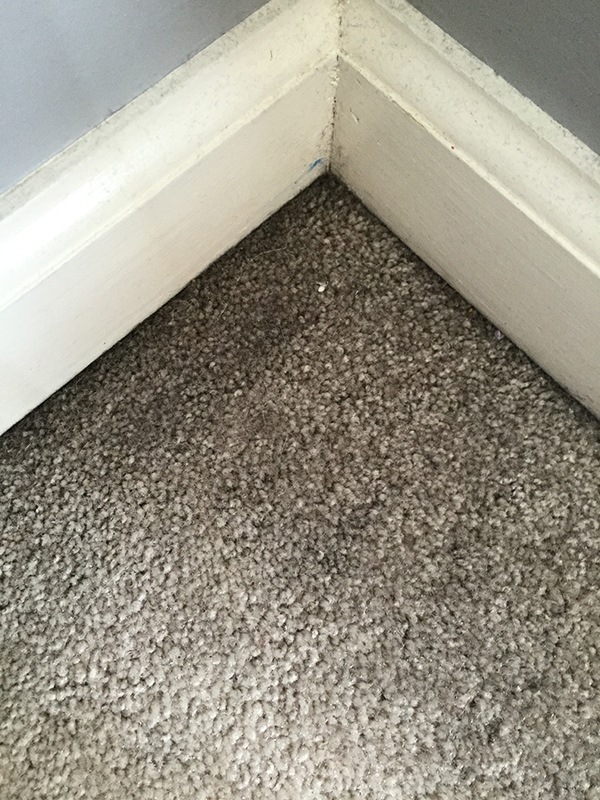 Our 15 year old carpet has seen better days for sure and it’s not just the cats that gave a it a beating, the worst part has been the edge and corners that have a black dust build up. I sometimes think it’s the area we live in which is surrounded by concrete companies. Our outside siding gets that same grayish-black dust and we have to pressure wash it often. 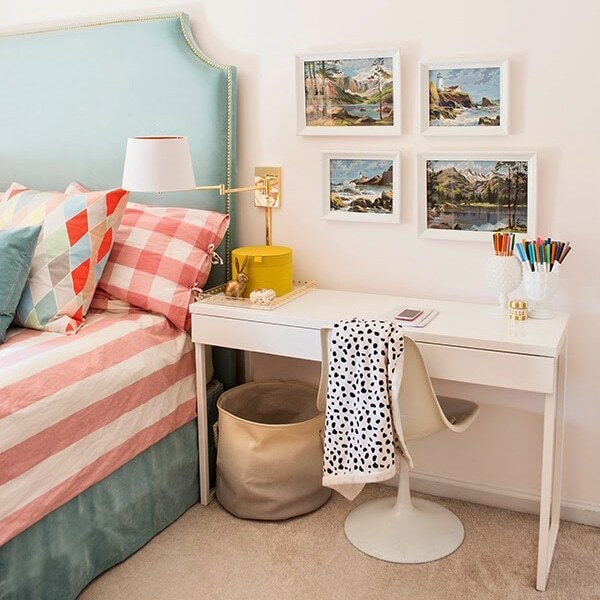 So here are the rooms that will get the hard floor and if you think that the carpet doesn’t look bad at all in the photos, then you are right, my cleaning tips (click HERE) have been working well. Especially using Clorox bathroom cleaner is working wonders on my light colored carpet, but the edges are truly yucky and I will show you later. And I think you guys might be wondering what it could be that I picked? Right? 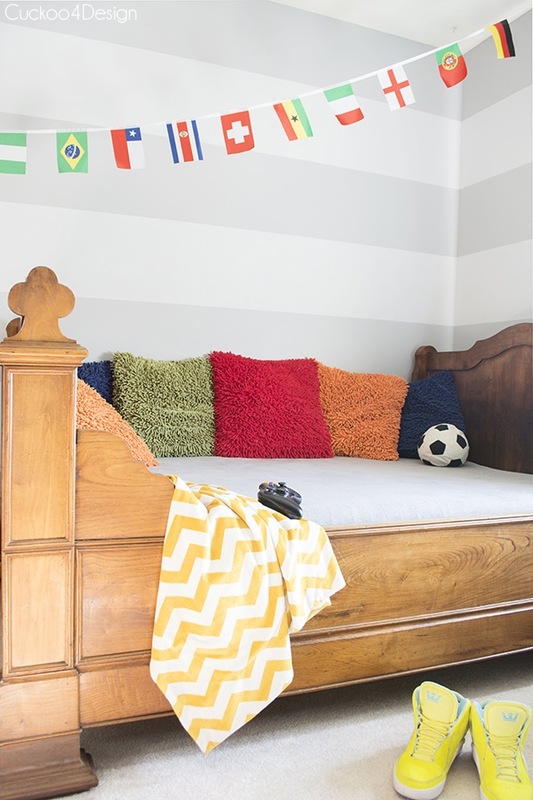 • I wanted it to be light like the wall-to-wall carpet but easy to wipe like our laminate. • And easy to install since I want to do it myself. Let me explain a little bit better why I chose the light flooring like we have downstairs besides the fact that I just love the look. Have you ever complained about dusting your dark colored or dark wood furniture? I know I have many times. I can’t make it look clean and that’s exactly what happens with dark hardwood flooring. It never looks clean and you can see every hair and dust particle on it. It would drive me nuts. 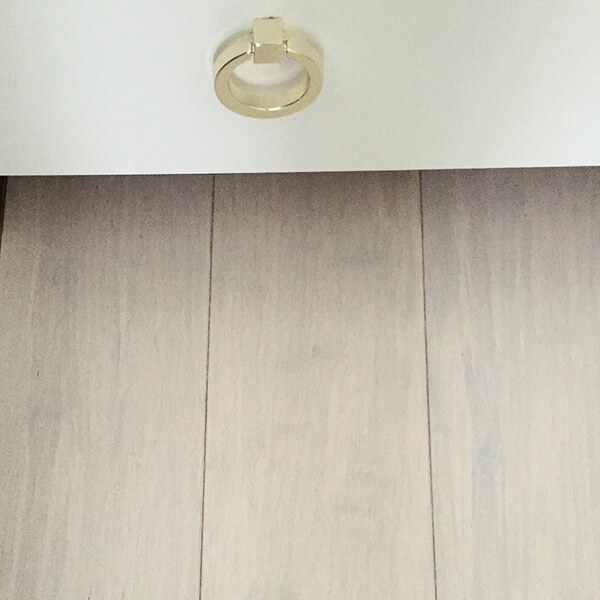 Our light colored wood laminate downstairs looks pretty clean on most days even with dust bunnies. I have had that light color for 15 years now and I never regretted the color. It’s definitely more of a European thing to get light wood flooring like that, I know that. I also have dark furniture yet like our leather bed and feel like dark flooring just isn’t me in combination with dark furniture. I didn’t want to get hardwood because of the fear of scratching it all the time and I definitely wanted to get something different to laminate this time around, ours swelled in a couple of spots downstairs where water leaked onto it. 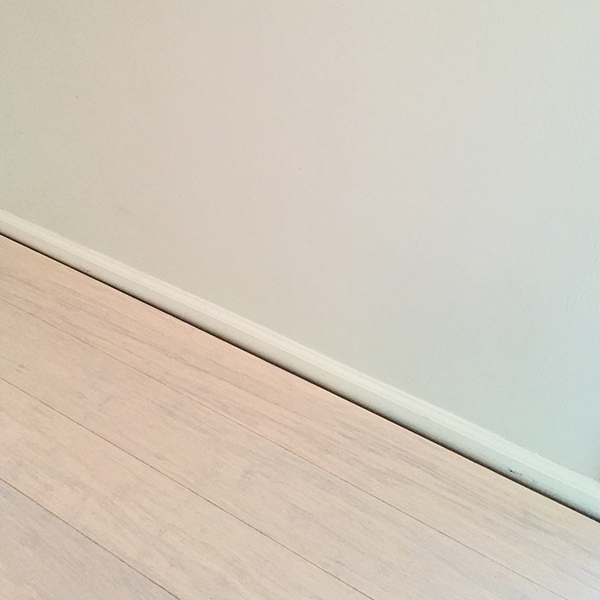 So I went with bamboo for our upstairs and not just light colored bamboo…it’s white washed bamboo from LumberLiquidators called Pearl City Click Bamboo. Yeah, I have to paint the baseboards too. The carpet even has some of the dark dust areas where the floorboards meet. You can see the pattern. I’m assuming it is from air blowing through but who knows. It looks different in certain lighting and I can’t wait to see what it will look like on a large surface. Right now it has to settle for a week in our house climate before I can start to install it. But first we need to rip out the carpet. Oh boy what a project but I can do it. Sorry pet fans but there won’t be a pet post again this Friday. Everyone is so busy right now and some scheduling hasn’t worked out for other bloggers. perfect choice- i love the lightness of it and can’t wait to see it installed! 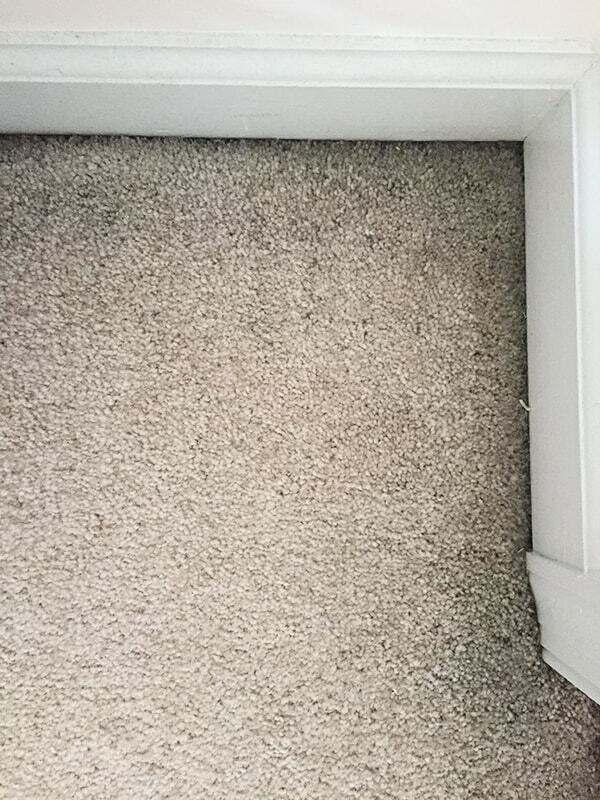 My carpet is about…..get this…42 years old. Wears like the proverbial iron. But the color is grim green and the corners and along the baseboards the same nasty black as yours. I credit the oil fired furnace air with making mine such a mess. This house is going on the market this year, so the next owners can deal with the carpet. btw, it was good when we bought the place over 20 years ago, as i have chemical sensitivity and the carpet was no longer off-gassing. But that was before laminate flooring caught on out here in the backwoods. I can hardly wait to find a place with/ready for laminate. Yours will be beautiful when complete…..have a ball tearing out the carpet…LOL!!!! Haha thanks, I think it will be fun ripping it out and putting it to the curb. My parents have had the green carpet since my childhood too and it’s still going strong. I will have to check that flooring out. I don’t think our store had that. They didn’t? 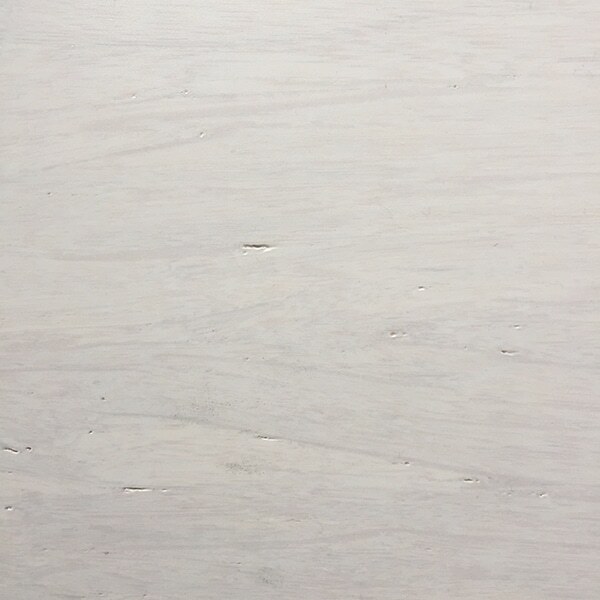 They had several whitewashed floors at our location. Oh I love the whitewash look also, been trying to find something just close to someday maybe I can afford. You will so love not having carpeting. I still lik. e the old yarn dust mops from my childhood for hardwood floors You might want to stock up on some Gatorade for tearing out that carpeting…. yikes, I hope to NEVER have to do that again. Oh yes, be sure to water the Gatorade down to 50% if you do use it. What do I need the Gatorade for Sheryll? Exciting! Can’t wait to see it go in! Me too! I wish I could snap my fingers. Thanks! I’m glad that mine doesn’t have an opinion in decor whatsoever. Makes it a lot easier! I have several friends who redid the floors with the light color wood and it looks so nice. It is so easy to install. It was one of the projects I learned how to do volunteering with Habitat for Humanity. It will look great with your furniture. Oh thanks that’s good to know. Julia, I agree. The light color flooring looks much cleaner! I have two rooms left in the house with carpet, my living room 🙁 and our basement. When we moved in there was carpet everywhere, even the laundry room and our three season porch! Ripped all of that out! The gatorade will be for the workout that ripping carpet out of your house will be! You are so right about the European thing with the light wood floors, they are in all of the bedrooms in my parent’s house! Viel Glück und viel Spass! exciting!!! can’t wait to see them! Thanks my friend. It is exciting, I can’t wait for the carpet to be out by the curb. I love the color of the new flooring! That’s super weird about your carpet edges. I have to admit, I’m a little jealous – our upstairs could use new flooring soooo badly!! New flooring is definitely a huge expense and I can’t wait to scratch it off my list. Oh oh oh, you’ve chosen the perfect flooring. I have the HARDEST time making decisions when it comes to flooring. I’m too picky with tile, and usually navigate toward dark hardwoods. After using a black porcelain wood tile in my bathroom, I too know the pains of keeping it clean (even minutes after giving it a good scrub). I cannot wait to see it installed in your rooms!! Oh yes, I know we had black porcelain tile in the basement a while ago it was awful to keep clean. It looks so pretty though. Okay…you’ve motivated me to tear out the carpet in my bedroom. I have oak hardwood throughout, but the bedroom is the last room to go. I’ve procrastinated because of all the staples holding the tack strip down. I just ordered a staple remover tool on Amazon to help with the chore. Also…that is the one room that gets the dustiest. I wish I would have restored the hardwood floors before I moved in as they are an orangey hue. But, the thought of having to move ALL my furniture stops me. I can’t wait to see your floors! Oh I guess I have to invest in a staple remover as well 🙁 Can’t wait to remove them all. Oh wait yes I can. Love your choice to go with a light flooring option! Can’t wait to see it installed! 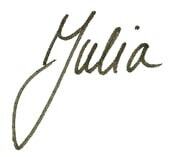 Oh Julia, that is going to be gorgeous in your home! I love that you chose something unique and is so fitting with your style, can’t wait to see it! Those are going to be seriously beautiful floors! Can’t wait to see how they look. I hope the install is easy. Yeah, the throwing up is insane sometimes and they still manage to find every area rug in the house instead of going on the solid floor surface. Oh this is gonna be gooooooooood!!!! I LOVE your black and white triangle pillows in your first photo! Where are they from? Hi Jordan, they are from H&M but they don’t sell them anymore. The only similar ones they still have are these here: http://rstyle.me/n/bgst894cgn but they have lots of other great pillows too.